In 1992 Varg Vikernes of the Black Metal group Burzum set fire to a series of churches in Norway. Vikernes documented his fires and used these photographs for the promotion of his band and as a tool to instigate others to follow in his footsteps. This triggered a spree of vandalism and arsons across Norway, Europe, and North America. 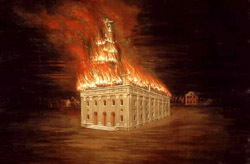 This video animates Carl Christensen's 1879 devotional painting, The Burning of the Nauvoo Temple. This collaborative project investigates the history of arson as a tool for rebellion, and the cyclical influence of music on youth violence, rebellion, and intimidation.